This game also offers the game mode demolition. In this mode players are separated into two teams, and they have to either protect the bomb site or they have to plant the C4 at the bomb site. This game mode right here is the heart of Counter Strike, and that's no different than CS:GO. This game mode influenced many other FPS games to have a demolition game type in their game. 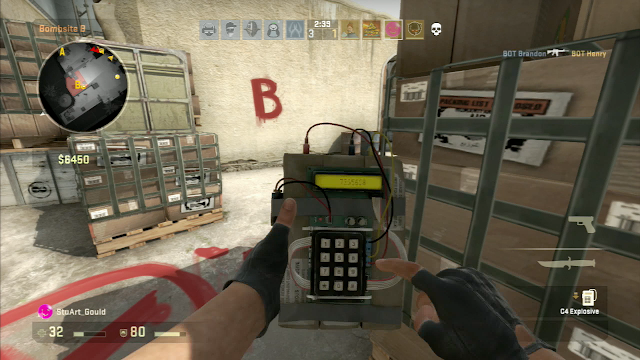 In this mode every player has 1 live per round, and you either win by eliminating the entire time, defusing the bomb, or by planting the bomb at bomb site. Many classic maps in other Counter-Strike games are back in this game and they are revamped with HD visuals. The classic maps that are back in this game are Aztec (defuse), Dust (defuse), Dust 2 (defuse), Inferno (defuse), Train (defuse), Italy (Rescue), and Office (rescue). Valve also created 8 new maps for this game, and every map is enjoyable. The maps that I feel the community love the most is Dust and Dust 2. These two maps are classic maps, that are probably the most played maps in any multiplayer game ever created. Such a classic map that must be played daily, this map is the definition that simplicity can easily translate to many mediums. This game is very similar on Xbox 360 and PS3 only difference is it doesn't have a community like their PC big brother. For the console version of this game I give the edge to the PS3 because you can hook up a mouse and keyboard to play it. That is very crucial in Counter-Strike because this game prides itself on precision Using a controller for this game doesn't provide players with the precision they need to be successful in this game, I feel that it hinders the player's experience in the game. Xbox 360 doesn't allow users to hook up a mouse and keyboard so I advise console gamers to get this game on the PS3 if they have a choice. Also another important thing about CS:GO on the Xbox 360 the game blocks party chat because they want to maintain the integrity of the game. Also by blocking party chat this game forces other players on the Xbox 360 to communicate with each other, which is very important in this skilled based shooter.